Spaces and locations have long inspired the work of artists. The symbiotic relationship between places and art is one that has inspired major works, from Vincent Van Gogh’s Café Terrace at Night inspired by the cafés of France, to Antoni Gaudi’s building La Pedrada inspired by Art Nouveau. What happens when a group of innovative artists are brought into an inspiring space, how does that place impact their work and how to they, in turn, impact the space? It is with these questions in mind that 21st Century Rennaissance presents The Courtyard Commission. 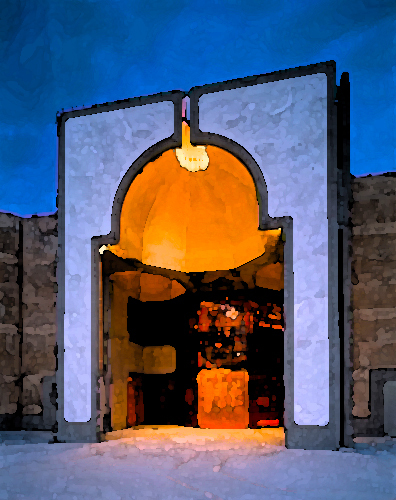 The commission brings together a group of Vancouver artists who were invited for a summer creation residency in the Ismaili Centre courtyard. The evening showcase will feature the work generated during that residency. The Ismaili Centre Burnaby courtyard is a unique space for a dynamic collaboration. Designed to bloom in all four seasons, the courtyard is a combination of organic flora and man-made architecture, each deliberately chosen to reflect both the surrounding environment as well as the architectural traditions of Islam. The space was conceived in the spirit of congregation, to foster dialogue, and to inspire peace and contemplation. Come and walk through the courtyard and experience a sensory journey, animated by interactive projection mapping, dance, and live modulated sitar music, imagined by dynamic local artists Nancy Lee, Laine Butler, Kiran Bhumber, Mark Nybo, and Mohamed Assani. Nancy Lee is a curator of interactions. Her crafted spaces stimulate behavioural dynamics, inviting their release into a broth of intangibles. In setting the stage for these action experiments, she is as much an observer as an artist. The notion of staging is a constant in Nancy’s work and underpins her projects from early days as a more traditional filmmaker, through her conception and planning of live events, and into the realms of new media and installation, where her art practices continue to coalesce and evolve. 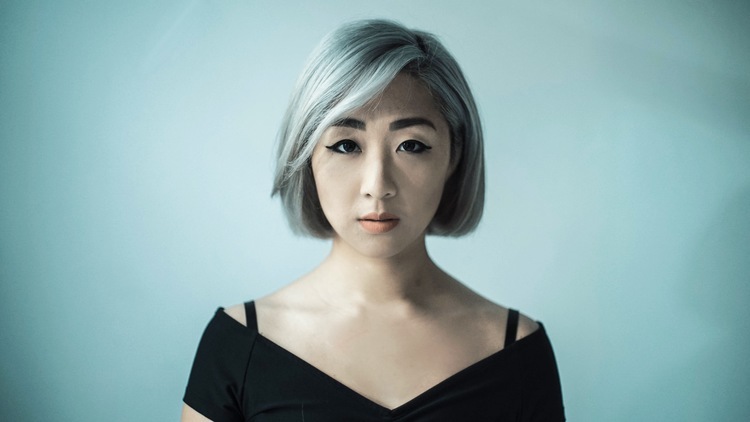 An avid filmmaker, Nancy has worked as a documentarian and advocacy journalist with different global health initiatives as well as with Vancouver’s Chinese-Canadian community, among others. The considerable responsibility she bears as not only the capturer but also a co-author of events while behind the camera has never been lost on her. Her persistent fascination with subjects’ negotiations of space in particular would germinate in her early film career and further actualize with her work in event coordination. Freed from having to stage interactions within a frame, Nancy is able – through her DIY and pop-up events held with the Chapel Sound art collective – to conceptualize space and test social relationships therein from the vantage point of an arranger. It was at one of these Chapel Sound events where Nancy first met Kiran Bhumber – now her partner in Pendula and co-founder of their burgeoning collective, Modalmix. Kiran’s unique predilection for creating interactive sonic and visual environments for performers matched uncannily with Nancy’s vision of an audience-driven apparatus, in the form of a swing, that would allow participants to manipulate their audiovisual surroundings in real time. Within a month, they were collaborating on their first installation and launching what would later become Pendula. They have since been selected for a BC Arts Council grant to bring Pendula to the Vancouver International Jazz Festival, as well as presented at the International Symposium for Electronic Art (ISEA) and the Electro-Acoustic Music Festival in 2015. Throughout her ostensibly different endeavours, Nancy has consistently challenged binaries: between artist and observer, individual and environment, audience and participant, psychology and art, to name just a few. Her work stimulates and enlivens space, making a provocative statement about how inescapably interconnected we are with our surroundings. 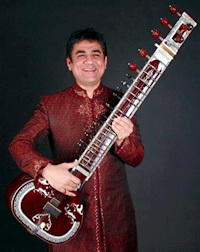 Mohamed Assani is a celebrated sitar player, known for his creative musical collaborations with artists of all genres. He has performed across the globe – including in the UK, Canada, USA & Dubai – with orchestras, string quartets, hip hop artists, DJs, world music ensembles, jazz artists, and Indian and Western classical artists—and, of course, solo. Mohamed’s musical journey began at Dartington College of Arts in England, where he did a degree in Western Classical and World music. He then went on to learn sitar in the traditional way and is a senior disciple of Ustad Ashraf Sharif Khan of the Poonch Gharana. A dedicated and experienced teacher, Mohamed has inspired students of all ages in their musical journeys. During his extensive teaching career, he has taught at the Royal Academy of Music (London, England), the BRIT School of Performing Arts and the University of Huddersfield. He now teaches Indian Music at the Vancouver Symphony Orchestra School of Music. Mohamed is based in Vancouver, Canada.